Equestrian Queensland, in partnership with the Queensland Government, is preparing a Statewide Facilities Strategic Plan to identify and prioritise equestrian facility needs across Queensland for the next 10 years. CPR Group has been engaged to assist Equestrian Queensland with preparing the plan. 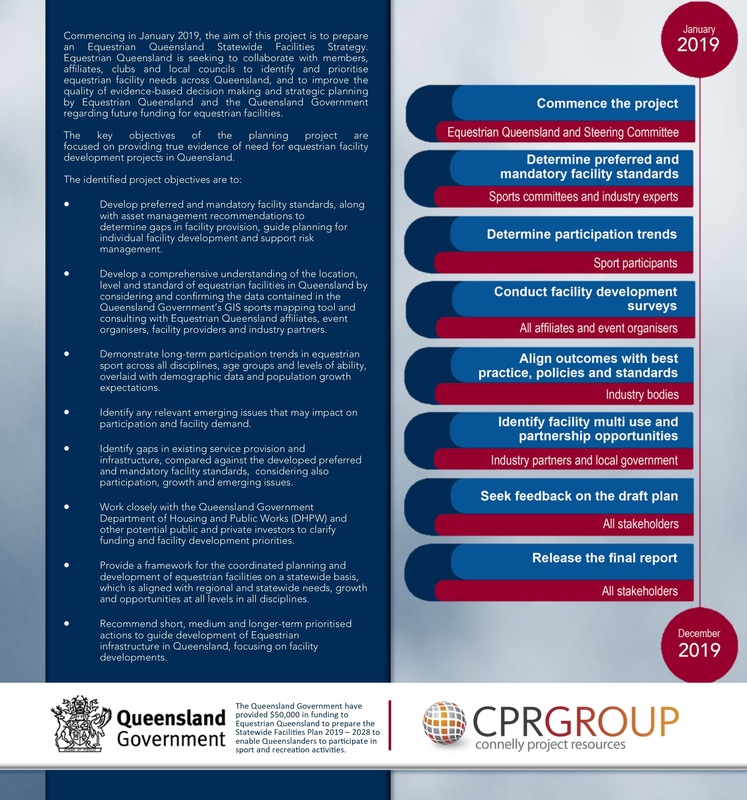 Your association or event committee is invited to complete this short survey, to ensure your facility needs for the next 10 years are considered in the Equestrian Queensland Statewide Facilities Plan 2019-2028. Having your association’s or event’s facility desires included in the plan will enable Equestrian Queensland to provide support in achieving your facility development goals and to utilise potential government grant funding sources. It is therefore vital that your association or event participates in this planning process. Ideally, this survey should be completed collaboratively by your association’s or event’s management committee and should take around 10 to 15 minutes. Please ensure that only one survey is completed per association or event committee. In identifying and outlining your facility plans for the next 10 years, please be realistic. Keep in mind your association or event’s ability to grow, your geographical location and surrounding land uses and your current and projected financial position. You will be expected to refer to Equestrian Queensland’s Preferred Facility Standards as the guide to assess your facility’s ability to meet your needs. These standards should be interpreted in conjunction with the specifications towards the end of the Preferred Facility Standards document. The specifications describe the extent and quality for each facility component. Thank you for your valuable input. If you have any questions regarding this survey, please contact Equestrian Queensland on 07 3891 6611 or via email at [email protected]. You may be contacted after the survey to provide further information if necessary.